There are some books I love, and others I respect or emulate and admire. All the King's Men managed to be all three; indeed, as I write this an hour or two after finishing, I am hard-pressed to describe either the book or my feelings for it, except to say that it is a big aching book, big as life itself, and that one ought to read it if only for the churning, impossible feeling it leaves you with after. Georg Lukacs, in his 1916 classic, The Theory of the Novel, wrote that great novelists finger the chasm of impossibility in life: they find the places where one part of existence rubs up against the other, and a chasm or gap opens up because they don't fit. These are the holes we fall into in life--the stuff of terror and truth, chasms of depth. Robert Penn Warren does just this with his exploration of the Time-Reponsiblity-Historical Greatness-Fate-Corruption question. A book both Greek and Shakespearean in proportions, ancient in its portrayal of tragedy, and yet every bit American, modern and fresh, it asks the big questions and--with the exception of one or two rather obvious plot conveniences that occur late in the book but which, in hindsight seem necessary if inelegant--takes neither shortcuts nor easy answers, but presses steadily and solidly at the faults of life itself. A must read. Also a beautiful read at the sentence level--from about the middle of the book on, I kept bookmarking passages and re-reading sentences (some as long as two pages; Warren is a master of the run-on), partly for the sheer breathtaking beauty and originality of how they were written, but also to learn (thus the emulation). From meditations on the incongruities of life to questions of fate, free will, and faith, to what, to this reader at least, read as extended riffs on the nature of the writing life and perspective of the writer, the book offers a dazzling array of ideas, questions, problems, possible solutions, and images. So this book is a thing of beauty and greatness--a massive accomplishment for anyone, but one perhaps made understandable by Warren's having also earned a Pulitzer in poetry (the only writer to do so ever).This was hands down the best American novel I have read. I still may love "To Kill a Mockingbird" more, but ATKM has my deepest respect. This book is a little bit tough to get into but has a huge payoff if you put a little work into it. It chronicles the story of the rise of fictional governor Willie "The Boss" Stark to power, and his subsequent fall from grace. Stark begins as an idealist, but then realizes that politics is where idealism goes to die. Stark turns into a corrupt governor, but one who uses his questionable methods to get his ideas done in an effective way. The story is told through the eyes of Jack Burden, a newspaperman who goes to work for Stark, and becomes in essence his right hand man. Burden is an interesting character and his views throughout the novel are insightful. He becomes almost as interesting as Stark at certain points but never quite makes it there. The way Stark changes throughout the book is fascinating and he deserves his place in the literary world. A winner of the Pulitzer Prize, this book is rightfully called the greatest novel ever written on american politics. As I said it can be a bit slow at times, it was written in the forties and the language can be a bit strange. Also the author has a tendency to have Burden to go on long tangents, where the plot doesn't move for ninety page stretches. These tangents are often interesting, but sometimes a bit much. When the plot does move though, it is thrilling. Everyone should read this book sometime in there lives, whether you have any interest in politics or not, it is a wonderful novel. Like a locomotive "All the King's Men" roared into my life, changed my view of the potential of fiction and burned the name Robert Penn Warren into my brain forever.A powerful story told in sparkling, beautiful prose picked me up as it raced towards its conclusion with a frightening story of how a man like Huey Long could grab, keep, and abuse power.Although Warren denies it "The Boss" seems to me to be a thinly disguised Huey Long, a populist who aspired for the White House.Willie Stark starting out a good man but then is inexorably corrupted by the very power he once fought against. Long's motto was "Every Man a King". Warren does say his story could be a warning of the danger inherent in Democracy.But its not the story but the long poem, the seductive, graceful, elegant prose that inspired awe in me. I was not surprised when I learned that Warren was a two time Pulitzer Prize winner and Poet Laurette. And what a wonderful combination.Words cannot express my gratitude Robert Penn Warren once lived and stamped his own personal beauty upon the landscape of American Fiction and on me. I wanted to read this because is is considered an American classic. It is said in many circles that it is one of the best novelizations of the American political system. 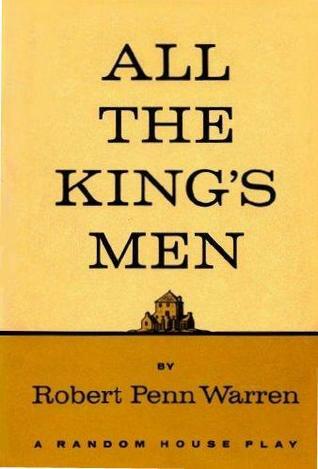 It took me awhile to get through it, Robert Penn Warren's writing style may be off-putting to some people. He has long drawn out explanations that sometimes (in my opinion) are a little TOO much, taking the reader away from the central story. I think Warren's strengths in being able to weave words and make the reader really see his story is great though. This is not an "easy" read by any means - and if you don't have any desire to read about American politics this is not for you. Took me a couple months. Overall a good book. A loosely fictionalized account of Governor Huey Long of Louisiana, one of the nation's most astounding politicians. All the King's Men tells the story of Willie Stark, a southern-fried politician who builds support by appealing to the common man and playing dirty politics with the best of the back-room deal-makers. Though Stark quickly sheds his idealism, his right-hand man, Jack Burden -- who narrates the story -- retains it and proves to be a thorn in the new governor's side. Stark becomes a successful leader, but at a very high price, one that eventually costs him his life. This story is a play of politics, society and personal affairs, all wrapped in the cloak of history. I wrote a big fat report on this in junior year of high school and found out a lot about how politics work, so it's worth a read for that. I remember that there are some literary values to it, but it's not what I remember 30 odd years later. Not really a fan of the kind of play where the narrator has to continually fill the audience in on what has happened between scenes or in the past of the characters' lives. May be different to actually see the play than read it. This book is a must read if only for Willy Stark's description of good and bad. An extraordinary book. Overrated American play and novel about an ambitious politician's rise and fall. Much better than when I read it in high school. Phenomenal. Timeless writing. Every word seems so deliberate. Tight plot. Spun like a spinner. This is one of the greatest novels I've ever read. Definitely in my top 5, along with the Bible, Shakespeare, and Faulkner. A very interesting play about the rise and fall of a political figure. Other than a slow start, strong characters and interesting/shocking moments make this a play worth reading. eh, could have lived without it! It's been a long time since I read this, but I remember really loving it the first time.